This is a cop-out post. Borrowed pictures with some commentary; no mental effort required on my part. 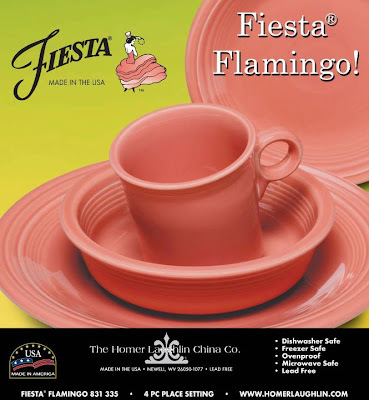 The word is out on the Homer Laughlin Facebook page: The 2012 Fiesta ware color is "Flamingo". 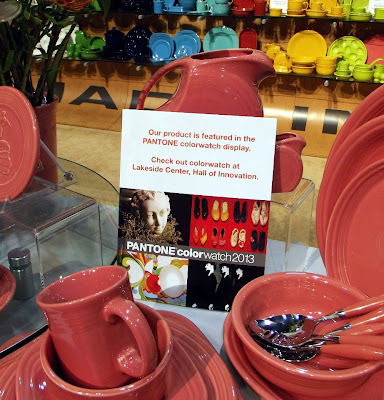 Everyone on The Next Fiestaware Color Should Be Hot Pink Facebook page was bitching because it's not hot pink, but the rumors have been going around forever that Homer Laughlin hasn't been able to develop a workable hot pink glaze. Personally, I'm A-OK with the lipstick/coral pink we did get. The last few colors--Ivory, Chocolate, Paprika--have been great but have been heavy on the earthtones. Pink of any sort is a nice change. 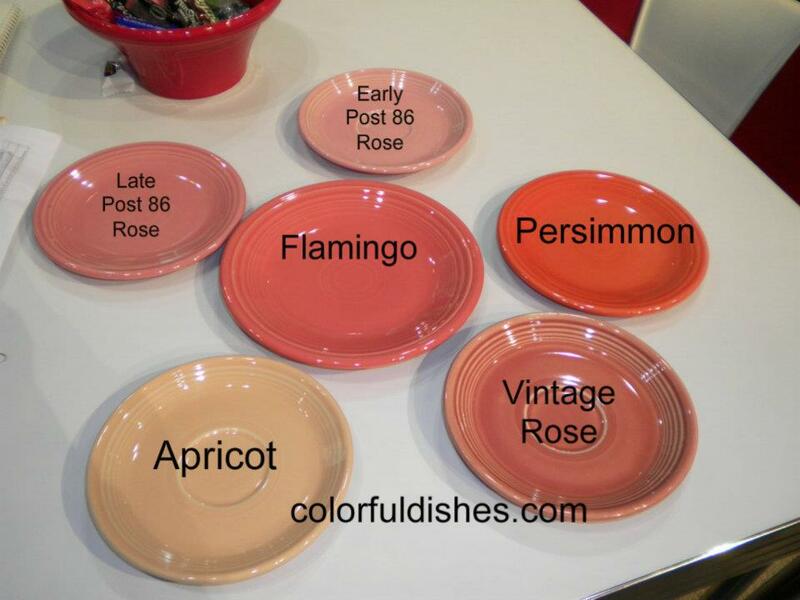 My Rose dishes are apparently early-run. They're light cotton-candy pink like the one at upper center. I actually like the late-run color better but light pink is better for contrast. I haven't seen it in real life yet since it's not supposed to be in stores in general until June, but it looks as though it's a little less orange, a little softer, and maybe a bit more opaque than Persimmon. I hope it really does look like it does in this picture. That might be my perfect pink. Pink that an olive-skinned girl can wear. Now, Homer Laughlin, if you happen upon this post: Your next neutral should be graphite gray; your next jewel-tone should be a saturated teal blue, Nile green, or medium blue violet; and your next bright should be a reproduction atomic red. Got it? I'm with you on graphite gray. Thanks for your post! I "inherited" some Fiesta dinnerware and what I received included some retired pieces like rose and powered blue. 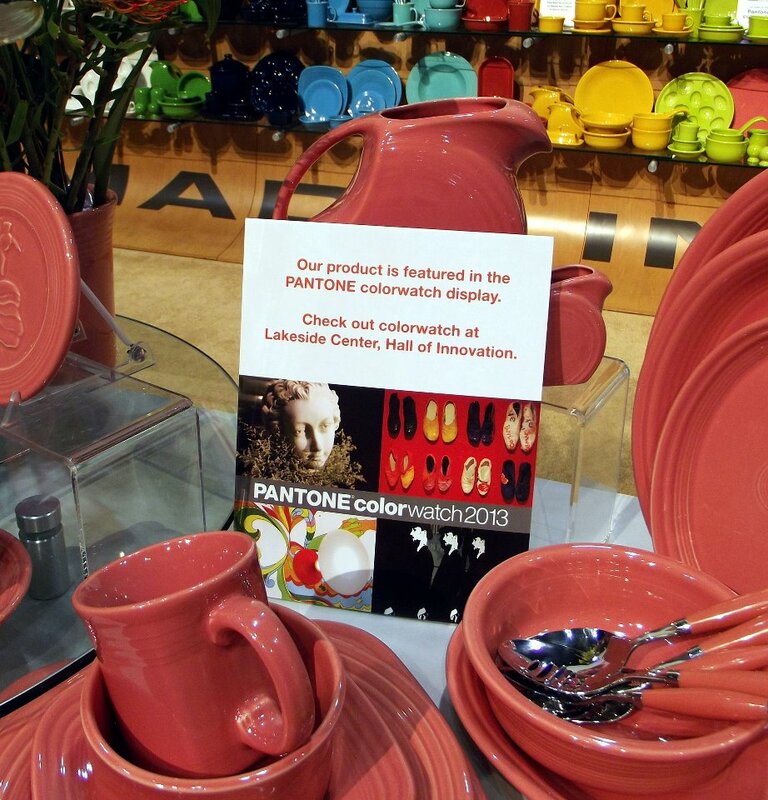 I had assumed my orangy-pink pieces were flamingo, but now I'm wondering if they are in fact persimmon. I totally agree with you on the color ideas!! Elaine, if you see this--Flamingo is a new color, so unless you inherited them very, very, recently, they're likely Persimmon. I'm in the middle of my second version of the Simplicity 1080 Dottie Angel dress and I have a feeling I added too much to the FBA. I did it differently this time than I did on the first one--it has a side dart but the armscye line was cut to the shoulder instead. I'll see when I get home and measure it and the Version 1 purple dress if it's as much too big as I feel it's going to be, and then try to figure out where I went wrong. Meanwhile, I just spent my lunch hour cutting out and altering scale models of pattern pieces becuause, yes, I'm that kind of person. All of these were expanded the same amount. I've made this a bunch of times so this was a pretty quick weekend project. The fabric I used here is Cloud 9 Cirrus organic cotton in Iris, which is a shot-weave purple/magenta. It's a bit like homespun but tighter. As a side note: I made some alterations to this already, but you don't need to do that to lengthen it. 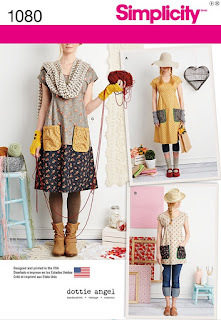 But you can do this with the stock pattern pieces. I didn't even retrace the pieces. 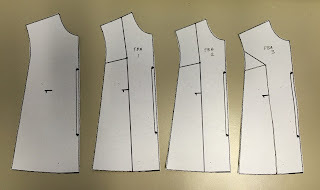 I just laid them on the fabric and used my clear ruler to measure down from the hemline and out from the waist point, and drew that on with a tailor's pencil. I added 14" of length (I'm 5'7"), which allowed for a bout 1" of foldover at the bottom to attach a bias hem facing. This was solidly full-length. Super-basic, blank-slate, knitting pattern for square things (square shawl, baby blanket, coasters, whatever) . . .
5 double-point needles, circular needle[s] for later when the project outgrows the DPN's. 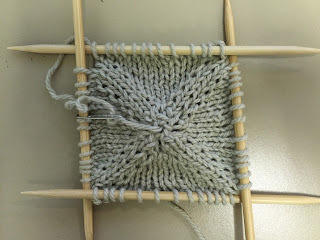 This isn't dependent on gauge--you can use tiny yarn and tiny needles or big yarn and big needles or anything in between. I used some old Sirdar Aran/worsted/4 weight and US8 dpn's here.